The plan of the lesson: 1. Phonetics. 2.Word Power. 3. 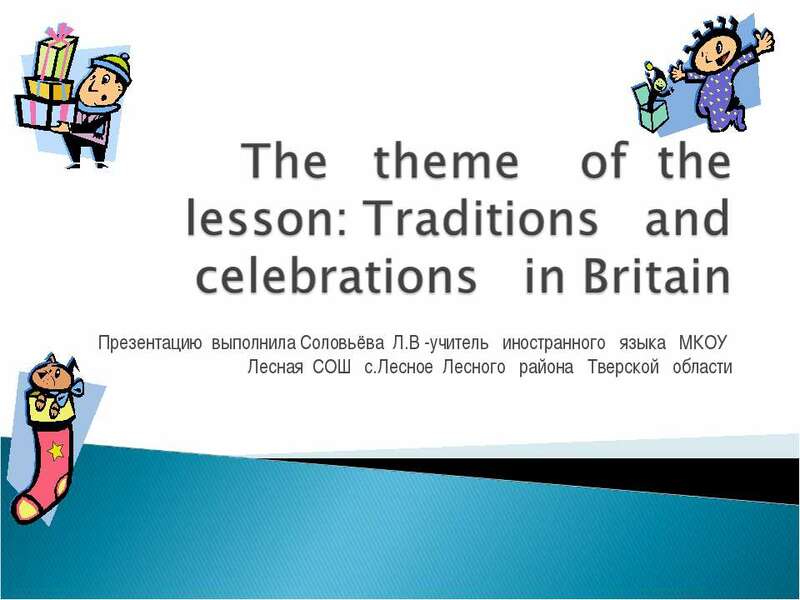 British celebrations. 4. Different activities at the celebrations. 5. New Year Resolutions. 6. Marks. Homework. New Year New Year’s Eve all British celebrate on the 31st of December. Most people see with friends and relatives. 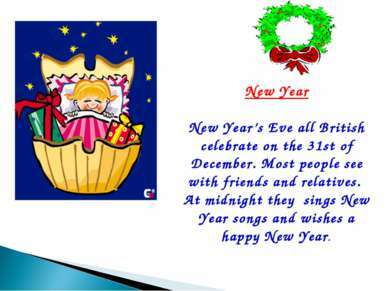 At midnight they sings New Year songs and wishes a happy New Year. Christmas On the 25th of December there is the greatest holiday of all in England – Christmas. 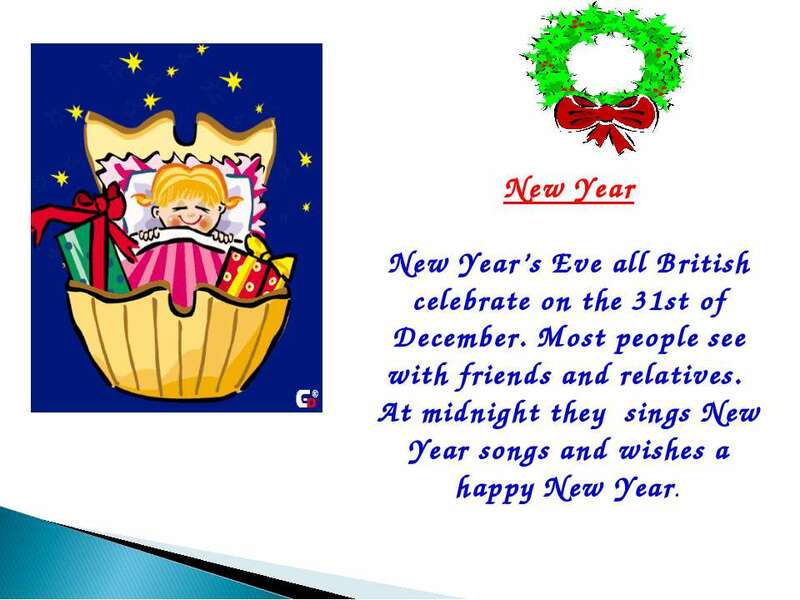 People send X-mas cards to their friends and relatives. 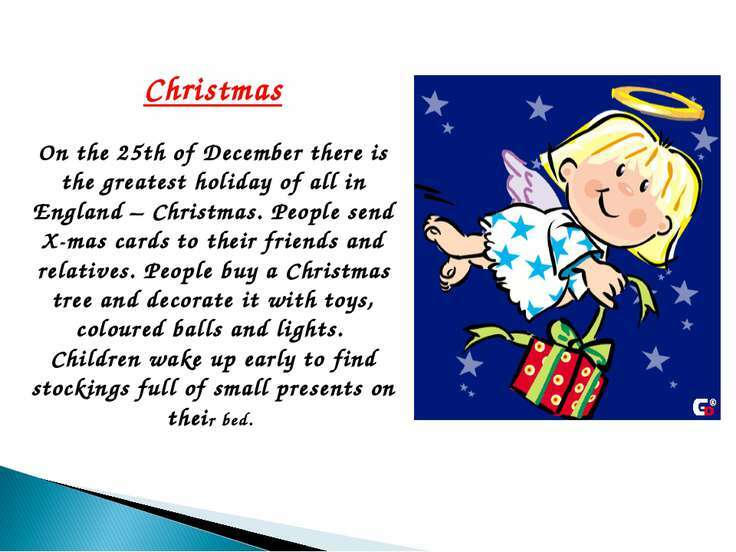 People buy a Christmas tree and decorate it with toys, coloured balls and lights. Children wake up early to find stockings full of small presents on their bed. 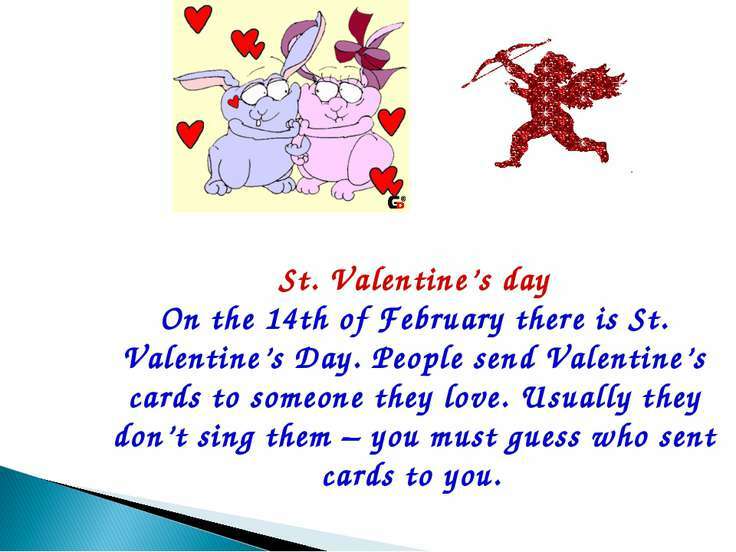 St. Valentine’s day On the 14th of February there is St. Valentine’s Day. People send Valentine’s cards to someone they love. 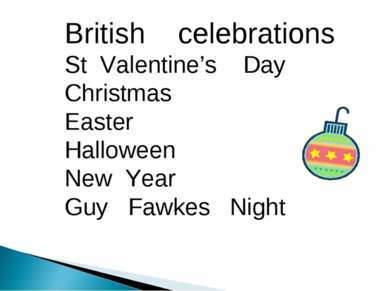 Usually they don’t sing them – you must guess who sent cards to you. 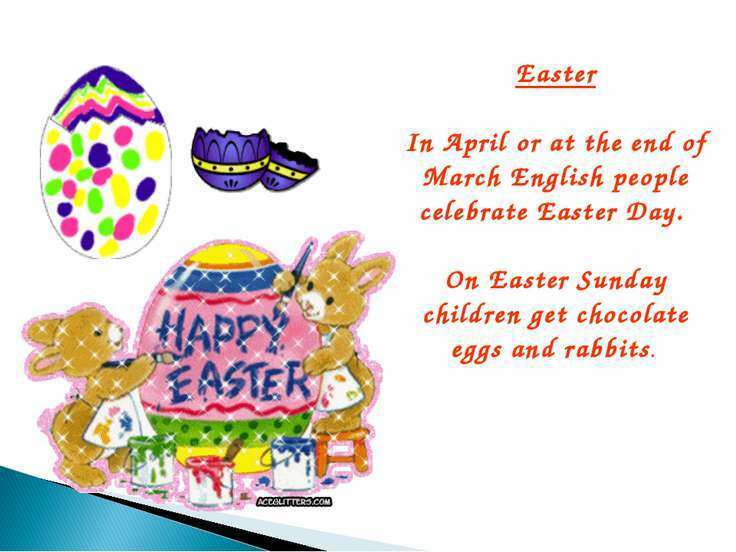 Easter In April or at the end of March English people celebrate Easter Day. On Easter Sunday children get chocolate eggs and rabbits. 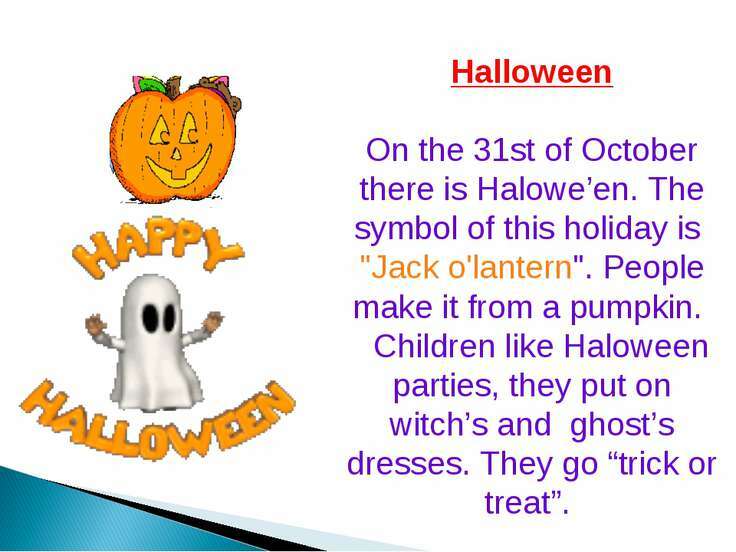 Halloween On the 31st of October there is Halowe’en. The symbol of this holiday is "Jack o'lantern". People make it from a pumpkin. Children like Haloween parties, they put on witch’s and ghost’s dresses. They go “trick or treat”. At different celebrations people are involved (вовлечены) in different activities. Ex.4, p. 85. People set off firecrackers. People give gifts to their relatives and friends. People cook dinner for the whole family. 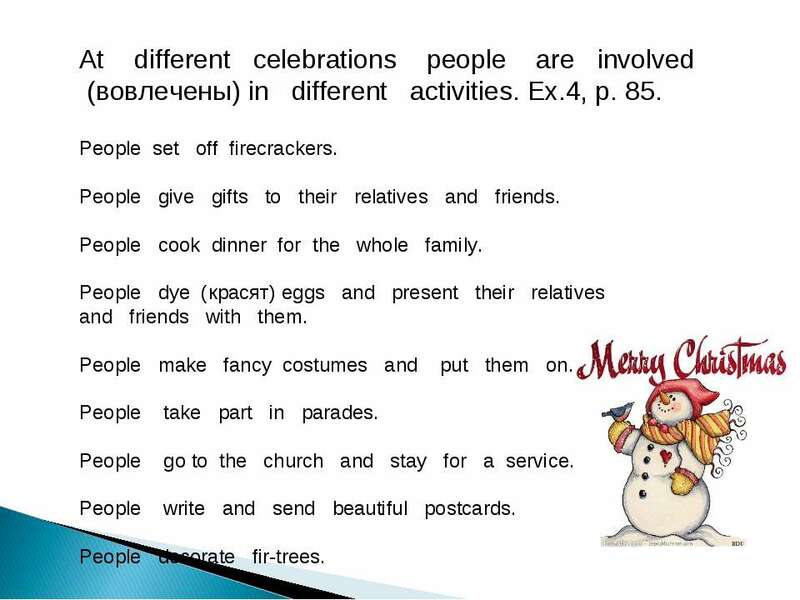 People dye (красят) eggs and present their relatives and friends with them. People make fancy costumes and put them on. 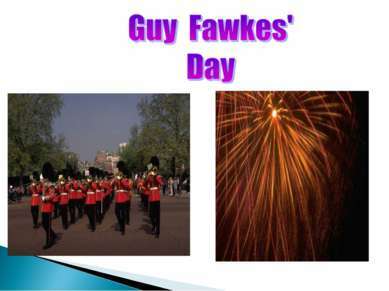 People take part in parades. People go to the church and stay for a service. People write and send beautiful postcards. People decorate fir-trees. 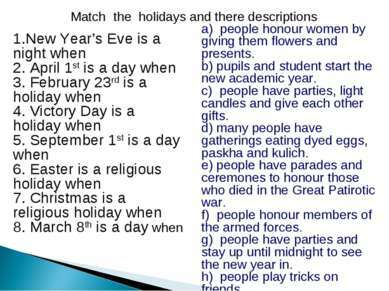 Match the holidays and there descriptions 1.New Year’s Eve is a night when 2. April 1st is a day when 3. February 23rd is a holiday when 4. Victory Day is a holiday when 5. September 1st is a day when 6. Easter is a religious holiday when 7. Christmas is a religious holiday when 8. March 8th is a day when a) people honour women by giving them flowers and presents. 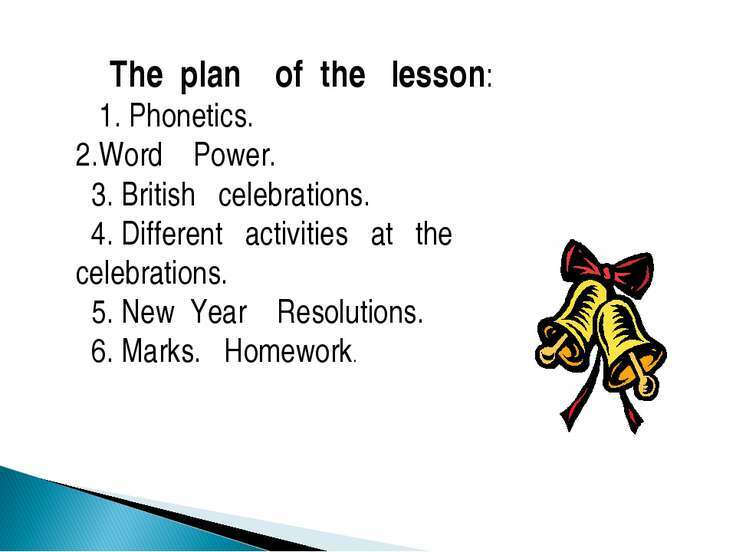 b) pupils and student start the new academic year. 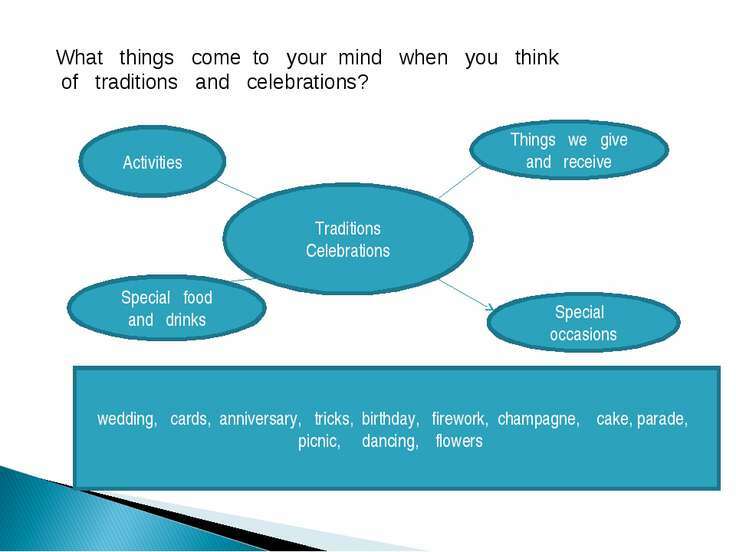 c) people have parties, light candles and give each other gifts. d) many people have gatherings eating dyed eggs, paskha and kulich. e) people have parades and ceremones to honour those who died in the Great Patirotic war. 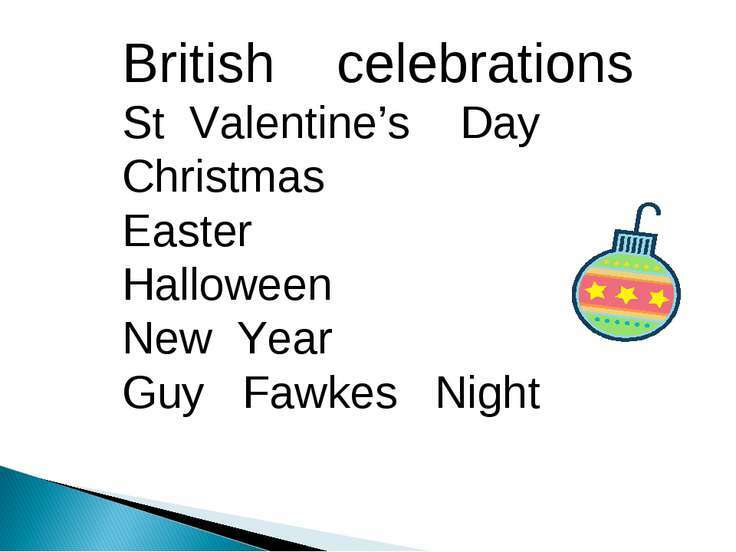 f) people honour members of the armed forces. 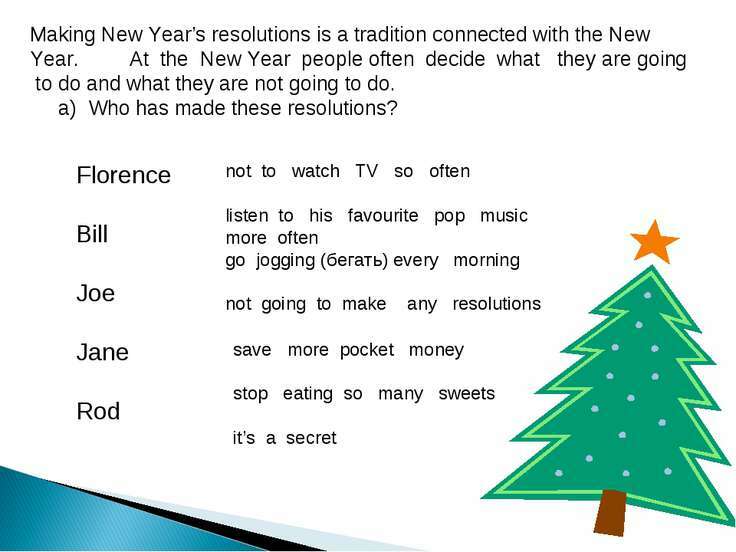 g) people have parties and stay up until midnight to see the new year in. h) people play tricks on friends. 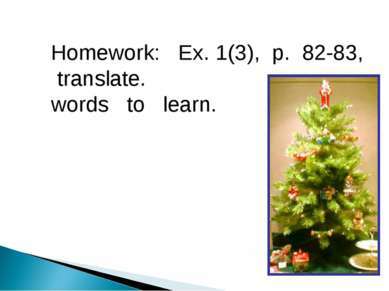 Homework: Ex. 1(3), p. 82-83, translate. 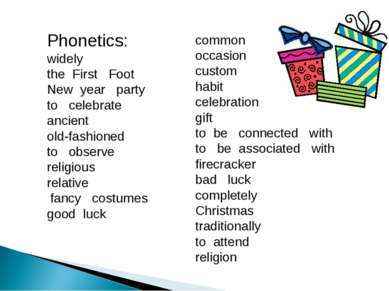 words to learn.